Not everyone has one of these. This rare object hangs in my living room. It is about 12 inches long, predominantly orange with green flashings along the tale and just behind the head, and with subtle mauve design work along the sides. It was created by the artist Johanna Stickland when she was a predominant member of the so-called Hillhurst School. For the artist, it represented a triumphant emergence from her turbulent plasticine era, shortly before she went on to master other forms such as pencil crayons and oil pastels. I think Hanna was about 8 when she brought this home from school one day. I’m sure that she reinvented the physiology of the fish as we know it with the various fins that seem to be in the wrong places. The markings behind the head look like crude stitches and give it the feel of Frankenstein’s monster, like the head of one fish had been stitched onto the body of another. When she brought it home, we laughed at just what a crazy fish it is, really, and then I hung it up anyway, because after all my daughter had created it and that was good enough for me. It’s hung in the various places we’ve lived in ever since. Of course, great art endures and stands the test of time. I don’t know that there is one single object in my place that I would grab if there was an all-consuming fire. Hell, I’d be a fool not to grab my laptop. But I know for sure there is no object in my place that means more to me than this one. There are many things about my daughter that make me very proud, but her approach to her life, her artistic sensibility and her great humility always fill me with wonder. Seeing her grow into an adult and the way she is living her life makes me feel that my part in her development is the one worth-while thing I have ever done in my own life. While I’m talking about her, let me share one story that in mind sums up her character. 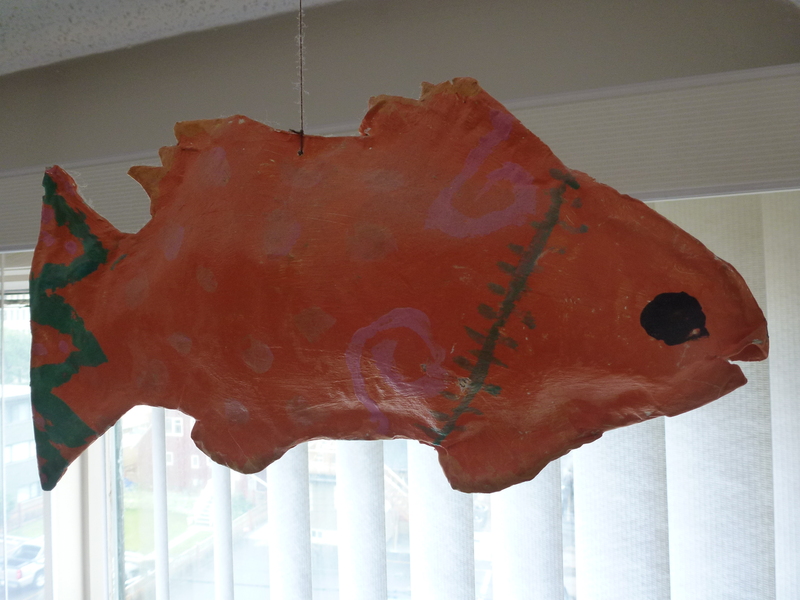 Around the time she created this wonderful fish, I was the playwright in residence at Alberta Theatre Projects. Over the course of her young life, Hanna had spent a lot of time at ATP and was certainly known and loved by my colleagues at the theatre. In 2000, when Hanna was 8, the company was preparing for a production of a play called Red Lips by Connie Gault for the playRites 2001 Festival. They needed an 8 or 9 year old girl to play one of the parts, and as Hanna was a known quantity, at least socially, I was asked one day if she would be interested in the role. It was quite an opportunity, and while she had never really acted, I thought it would be an amazing experience for her. The next day at the theatre, when asked what Hanna’s decision was, I rather sheepishly reported that she would need to read the script (Duhhh) and got a copy and took it home. That’s how she was at 8! She did the play and acquitted herself very well. I have never been as nervous in my whole life as when she came on stage, but she did a wonderful job. And you might think that would have led to a desire to do more acting, but it didn’t really. She enjoyed the experience, learned from it, and then moved on. I think it was much like that with her modeling career. She did it for a few years, she did extremely well, she became quite famous, but then it seemed time for her to move on again. After a hiatus during which time she returned to Calgary and completed high school, she is back at it, but now on the other side of the camera. In this way, her life continues to be an unfolding and beautiful exploration of the nature of art. She is a graceful, gentle, intelligent girl, beautiful inside and out. And that sense of Hanna the girl, Hanna the artist, I suppose must be what goes through my mind when I see this fish, although I don’t always say it. But I surely feel it. Even in looking at this crazy fish. Looking around for a musical offering for this post, I looked at the hits of 1992. There were some very good songs that year (November Rain) and some very bad ones (remember Criss Cross?!). This one is neither good nor bad, it’s just silly, but it’s awesome in its silliness and it seemed appropriate. Then again , maybe we should think about some kind of ” loan ” idea. You know the Steel Head done by Jimmy Wright but you don’t know “Fish with Bones on Back.” Reminds me of H.S. first work in some ways .Lets talk when I am recovered. Shall we? The fish is not for sale or trade. Period. Get your Chagall out of here.